Mary’s deep passion for books began at a very young age. Read a story to her once and she was fully engaged. Give her the same picture book a second time and she could repeat the story nearly word for word. How then, her parents wondered, could this highly intelligent child with such a rich vocabulary and unmistakable gift for storytelling make it all the way through second grade still unable to read? Mary is a visual thinker. She has no real internal dialogue, which means that she doesn’t hear her own voice inside her head as she reads or thinks. Instead, she sees pictures. Dimensional, interesting, glorious pictures. With no internal dialogue, you can understand why phonics rules make no sense to Mary. She has trouble associating sounds with symbols. Tell her 100 times that this flat, 2 dimensional letter b says the sound “b” and you’ll be wasting your breath, not to mention increasing Mary’s feelings of inadequacy. Her brain does not register the association. Perplexed, her parents want to know how Mary can read ten dollar words like hippopotamus without a second thought, yet simple words like cat stop her every time. The reason? Mary uses her strong visual skills to memorize the unique visual patterns of larger words. She then matches the pattern with her mental image of, say, a hippopotamus and instantly recognizes the word. Since cat looks very similar in shape to bat, or sat, or mat, memorizing its shape does nothing to help her. Remember, short words like cat are only “simple” if you have the ability to sound them out. Mary does not. Mary has always been inquisitive, creative, and curious. As a visual thinker she tends to think and process information much faster than her verbal thinking peers. Because she relies heavily on auditory input for information, most of Mary’s teachers are delighted by her active engagement during class discussions. Her love of books and stories all began when her parents read stories to her out loud. This allowed her to strengthen her natural mental movie-making skills that, in turn, continue to feed her imagination. Tea parties were extravaganzas. Family and friends now become characters in her dramatic stories. Is she the next Steven (or Stephanie) Spielberg in the making? Or the top saleswoman in her industry? Perhaps, but she’s also a gifted artist. With a keen understanding of perspective, her drawings are vibrant and full of depth. She has multiple talents and high-value skills that many of her reading peers simply don’t have. Clearly not all gifted storytellers struggle with reading. However, non-readers who resemble Mary’s storyteller profile become strong readers with a number of educational therapy techniques. I’ll list just a few of them here. While we do want Mary to maintain her incredible visual talents, we also want to train her brain to develop an internal dialogue. Rhyming games are just one way to do this. You can check out my Auditory Learning Pinterest board here for a few ideas. Creating letters and words out of clay transforms them into 3D objects. This perfectly taps into the way The Storyteller sees and learns. For more information about clay work I highly recommend Ron Davis’ book The Gift of Dyslexia. Clay work is especially helpful for troublesome sight words that have no clear visual representation. Can you visualize the definition of the word “the?” Neither can the visual thinker. Clay work helps create that visual connection. 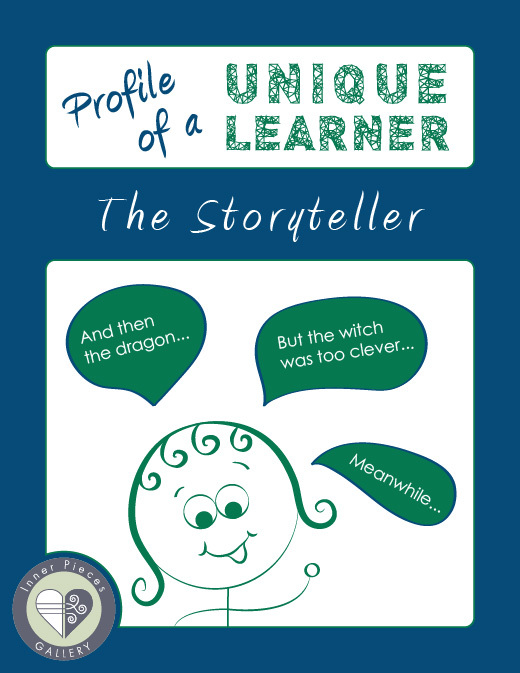 Some struggling readers like The Storyteller find themselves reading random words from different lines on the page. Suddenly they read a word from 2 lines above or 3 lines below the line they are reading. Building Visual Tracking Skills THE BOOK targets this issue plus helps students build visual discrimination skills at the same time. Find this printable activity book in my TPT store here. Next profile, The Flip Flopper. You might also like the first in the series, The On Again Off Again Student.